Desperate times call for daring measures as Honor Cabot, the eldest stepdaughter of the wealthy Earl of Beckington, awaits her family's ruin. Upon the earl's death she and her sisters stand to lose the luxury of their grand home - and their place on the pedestal of society - to their stepbrother and his social-climbing fiancée. Forced to act quickly, Honor makes a devil's bargain with the only rogue in London who can seduce her stepbrother's fiancée out of the Cabots' lives for good. 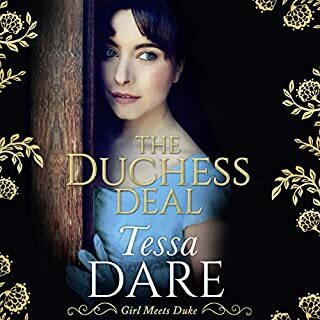 When the young ladies of the Fairchild family learn that their stepfather has absconded with their late mother's fortune, Ava, the eldest, hunts down the notoriously wealthy rakehell Jared Broderick, the Marquis of Middleton and heir to a dukedom. Much to her shock and delight, the marquis sweeps her into a whirlwind romance and proposes marriage. But after their passionate wedding night, Ava discovers Jared has ulterior motives of his own. Not only does he expect her to deliver an heir while he continues to enjoy a rogue's life, but Ava also suspects she is a pawn in her husband's quest for revenge. Lady Rebecca Newland cannot forget the captivating nobleman who saved her life, and she sets out to meet him again when she is of an age to be courted. Unbeknownst to her, her timing is impeccable, for Devon Sinclair, the future Duke of Pembroke, has just been informed by his mad father that he must take a wife before Christmas in order to thwart a family curse and preserve his inheritance. Lady Rebecca is everything Devon could want in a wife - she is beautiful, charming, and she desires him openly. With dreams of a great romantic love, Abigail Carrington sails to England to marry the man she has loved since childhood, Michael Ingram, Marquis of Darfield. She believes her betrothed is a generous and noble man who has been longing for her. But the handsome man waiting for her at the altar is a dark, brooding stranger who rushes her into marriage, then abandons her at his country estate. Only the passion of Michael's kiss gives her hope that theirs can be more than a marriage of convenience. ©1998 Dinah Dinwiddie (P)2013 Audible Inc. This will twist your heart! Would you listen to The Devil's Love again? Why? This book has been a favorite of mine for a very long time. I've been re-reading/re-listening to some of my favorites. This is one that has been on my mind for years, because I loved it, but couldn't recall the title. Much to my delight I am able to listen to it, which I can't thank the publishers enough for. Once I started listening I could not stop, and when I finished it, I immediately started it over. This has all of the ingredients that make a romance perfect for me. I laughed and cried, and, could not put it down. I think Anne Flosnik is an excellent narrator. Sometimes she gets a little too excited during the love scenes, so I fast forward a bit. I hesitate to critique an animator when I think about what a difficult job it is to forget the narrator, and become immersed in the story, that makes a narrator, like Anne Flosnik a great narrator, in my opinion. Sometimes it takes courage to find a perfect love. 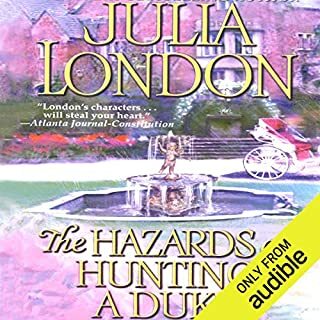 I'm thrilled to have found this at Audible. I am a huge fan of this author, and I am hoping to find her other books here as well. For some authors it is their earlier books are their best. That isn't to say it is the case with Julia London, but I think of them as buried treasure, so please keep them coming. Michael Ingram, Marquis of Darfield, prefers to be a recluse, because of his family's past indiscretions, debts, and scandal. Even though he agreed to a betrothal to Abbey, a wealthy merchant-captain's daughter, many years ago, in exchange for paying off his wastrel father's debts, when the time comes to fulfill the contract Michael does not want to marry her. Abbey had fallen in love with Michael when she was 9 years old when he was aboard her father's merchant ship. She followed him around the ship with her pirate sword at the ready to get his attention, but he ignored her when he could. Over the years her father regaled her with stories about Michael's love & devotion to her, even giving her periodic reports on him and telling her of his continued devotion to her; giving her gifts supposedly from Michael via her sea captain father. After her father's death, remaining a naive ROMANTIC little girl mentally, she travels to England to marry him, expecting Michael to be in love with her and pining for her, as much as she has pined for him. Although she has not seen him, nor talked to him in 10 years, she has a portrait of him supposedly painted just for her, and her father's romantic stories telling of his unfailing love for her. All he recalls of Abbey is a wild, dirty hellion whom he couldn't stand. She excused his ignoring her, still dreaming of a grand love...until she learns the truth, that her father had been lying to her all those years, and in reality Michael did not even like her. Michael offered her a way out of the marriage, but Abbey was devastated and confused and having no place to go, she married Michael. She was so naive, but she was sheltered all her life and she was only nineteen. She had built an image of Michael in her mind and heart of an honorable man who loved her desperately. She had dreamed of their perfect love and marriage built on her father's lies. Despite his uncaring attitude during the day, she never stopped loving him. The story includes humor, revenge, shooting, betrayal, murder, sexuality, duels, and unrequited love. What did you love best about The Devil's Love? It holds your interest from the very start to the finish. I loved Abbey's strong character. Which character – as performed by Anne Flosnik – was your favorite? I like AF especially for the women's characters and the children, but not so much the men. I don't want to give the story away but I hated what Abbey's father did to her and Michael had every right to feel the way he did. I enjoyed the love, romance and stormy words between them. It makes you wonder how it will end. Ms London is one of my preferred authors and she did not disappoint me in this one. It made my day during a gloomy rainstorm and kept me from going insane. I loved the characters especially the gardener and his roses that no one can touch. I also loved when the family came to visit from America, hilarious!!! Anne another of my preferred narrator did a great job as always. Well worth the credit! Once in a while I will read a book that brings a tear to my eye. This book was one. Abbi's own naivete helps create her sad situation. You can almost feel her pain. I liked this book a lot. The story definitely had promise and then half way into the book it took a bad turn. The reasoning behind all the heartache the hero at first and later the heroine experienced seemed rather stupid and childish and to drag it on and on was pure torture. It seemed as though the book had to be a certain length and once that was accomplished the story changed direction almost completely over a few pages. I found it interesting up to the midway point and a complete waist of time and terribly emotional over stupid dilemmas after that. The story is good for a typical romance... I didn't get immediately bored. It would have been ten times better if not for the insulting narration. The heroine... in spite of the terrible infantile narration of her character. What didn’t you like about Anne Flosnik’s performance? Horrible... absolutely horrible... I felt like she was mocking the story the entire way through. She does fine so long as she is not attempting voice overs... however her character interpretations are insulting and insipid. The men are dull and vapid, the women are childish and speak with an unbearable baby voice. I actually thing that the narrator simply hated the story and tried to make the character as stupid and uninteresting as possible. Thankfully the writing wasn't as bad as the narration. Yess... the narration made me want to vomit... it was SOOOOOOO... bad.. I think the story deserved better. Really would like to have the time to read this story on my own without the annoying narration... It would have been really charming with Rachel Weiss and Ralph Fiennes narrating. 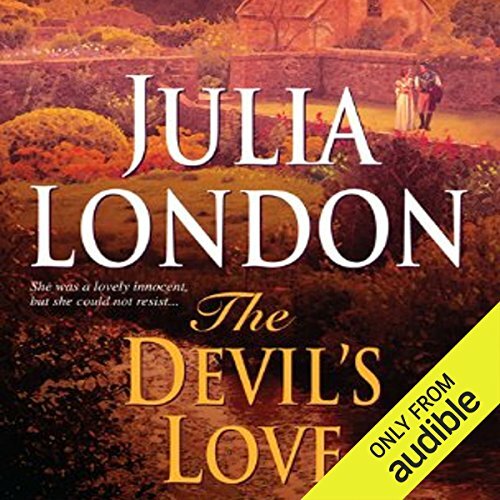 As a romance lover I am never disappointed with a Julia London book, especially if she teams up with Anne Flosnik because together they whisk you away to a bygone era where, thanks to richly described imagery, you can imagine each scene as it unfolds. With a full cast of interesting characters, a storyline that is bound to get your heart beating faster and a hero and heroine that will overcome everything to end up in the arms of each other. Then sometimes she creates a story that is so intense that you just want to stop everything and immerse yourself.... well this was one such book for me. Briefly starting in 1813 then fast forwarding to 1825 it tells the story of Abigail a beautiful, very naive but courageous, happy and well educated innocent and her hopes and dreams of her childhood love aboard her Father's ship - Michael who's now a handsome Rake and the Marquis of Darfield (aka the Devil of Darfield) but destiny, along with her Father, has played a cruel trick on them both which crushes and destroys those dreams and leaves heartache in their place. I'm not going to spoil this journey as it's yours to take with Abigail and Michael but as their chemistry ignites there's lots of angst, arguments, misunderstandings, verbal sparring, humor, heartache, emotional turmoil, revenge, conflicts, manipulation, murder, tragedy, passion, tender touching times and a couple of frenzied love making scenes. At the start Michael is arrogant, dark, cold and dislikable and Abigail is too naive but through their many hurdles together there's such character growth which makes them into two loveable people. Worth a credit? My emotions have been put through a full 13 hour workout... angry, sad, hopeful, angry, hopeful, annoyed, sad, happy, worried, shocked, speechless, devastated, worried, sad, frustrated, hopeful again until I was finally moved at such a declaration of love and a JOYOUS Epilogue. This entertaining and enjoyable listen will eventually leave you with a smile on your face that was so worth the credit. Good story but the voice of the narrator was to much. It was a good story but the narrators voice was too distracting and just to gruff. I absolutely loved the first half of the book. There was no angst, there was communication, no stupid misunderstanding, I didn’t want to slap anyone, and there was a lot of love building. The second half I was disappointed. I was annoyed and thought she was being stupid and stubborn. It was hard finishing it.